This Thursday 5 December 2013, I will be one of the speakers at the Bar Council’s Forum on Liberalisation of the Legal Profession. I am to give a young lawyer’s perspective on liberalisation. The registration form can be downloaded here. I have been following closely the incremental steps forward that Malaysia has been taking towards liberalisation and I wrote about liberalisation earlier. I will be very interested to hear from all the speakers that morning. Singapore’s Business Times reports that the Singapore law firm WongPartnership has entered into a strategic alliance with Foong & Partners. “This tie-up was driven mostly by the fact that a lot of the work we do today (corporate transactions in Singapore) tends to have a Malaysian component – whether it be an IPO (initial public offering), M&A (mergers and acquisitions) or private equity (PE) deal – because the target may have a business in Malaysia, or the clients may be interested in looking at something in Malaysia, and so on,” WongP’s joint managing partner, Ng Wai King, told The Business Times in an exclusive interview. Mr Ng said that WongP has been collaborating with Malaysian lawyers on such transactions, including the Temasek Holdings and Khazanah Nasional Berhad joint development in Singapore, the IHH Healthcare Berhad IPO and the Khazanah/Fortis competing takeover offer for Parkway Holdings. “We find that the need to work and collaborate with strong Malaysian lawyers has become more important now than ever before. Finding the right Malaysian lawyer with the right expertise is very important. “We have worked alongside FoongP on a number of transactions, including Tune Ins Holdings Bhd’s recent initial public offering, and we found a shared ethos of delivering unstinting high-quality service to our clients,” Mr Ng said. Foong Chee Meng, managing partner of FoongP, which focuses on high-end corporate commercial, capital markets and corporate finance work, added: “There are a lot of Malaysian clients who are expanding, looking to invest not just in Singapore, but in the UK and Australia, and they’re very aggressive in their expansion. I find that, in most cases, I’ve had to help them and also refer foreign law firms to them. I’ve gone through quite a number of foreign law firms as well and I’ve always enjoyed working with WongP. It makes sense to work a lot closer than before, to have a formal association, whereby we give each other the attention, the priority and the preference. 1. Allen & Gledhill is associated with Rahmat Lim & Partners. 2. Rajah and Tann is associated with Christopher & Lee Ong. 3. Baker & McKenzie has its Singapore firm Baker & McKenzie.Wong & Leow and Malaysian firm Wong & Partners. 4. Oon & Bazul is associated with T S Oon & Partners. 5. KhattarWong also has a cooperation agreement with KK Chong & Co. I contributed to two articles on LoyarBurok where a group of five of writers shared our views and advice to law job applicants. This was targeted at applicants for pupillage or for junior associate positions, and we shared our tips on the making of the application as well as the interview itself. Definitely worth a read. A lot of the tips in there sound a bit basic but time and time again, I see the same mistakes and the same weaknesses cropping up in law firm applications. Recently, I find certain covering emails lacking in formality e.g. 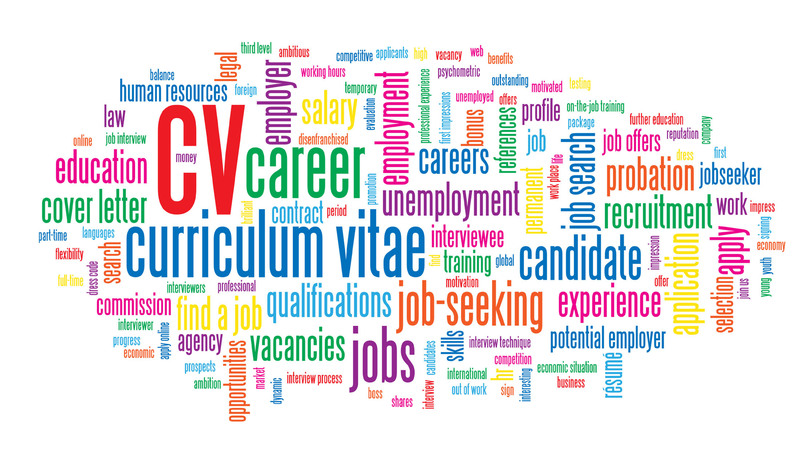 “Hi, I am Joshua here” (which is also grammatically wrong) and in another case, I received a Word copy of a CV which still had its changes marked out. Further to my earlier article on the liberalisation of the Malaysian legal market, the two Legal Profession (Amendment) Acts 2013 (here and here) have received Royal Assent and have been gazetted on 1 November 2013.This means that the last tranches for liberalisation have now been put in place. The Acts will now come into effect on a date to be fixed by the Minister. Personal Money – Stuck in a Bankruptcy Quagmire? 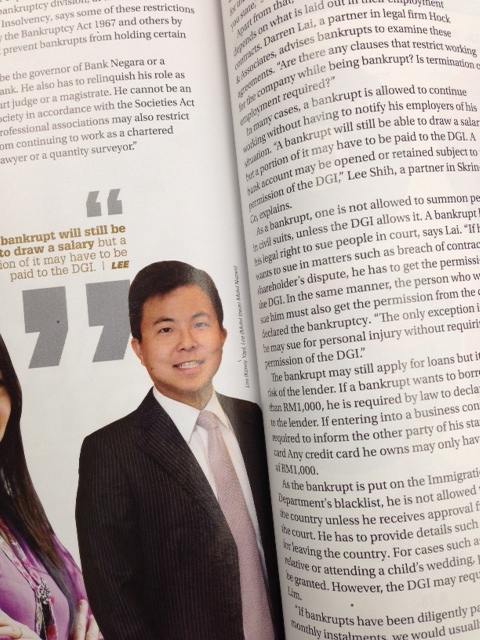 I appear in the November 2013 issue of Personal Money in an article featuring bankruptcy. The article examines a bankrupt’s rights and obligations and how to get out of debt. It is an interesting article and it features views and commentary from three lawyers, an officer from the Malaysia Department of Insolvency (MDI) and a representative from the Credit Counseling and Debt Management Agency (AKPK). With 113,133 bankrupts recorded by the MDI, the number of bankrupts has been steadily rising over the past few years. I reproduce below my article published on LoyarBurok which is an updated version of my article originally published in the July-September 2013 issue of Malaysian Bar’s Praxis. I set out the new legal framework which will allow foreign lawyers and foreign law firms to practise foreign law in West Malaysia. The liberalisation of the legal market in West Malaysia to allow for the entry of foreign lawyers has been the subject of discussion stretching as far back as 1999. The momentum for such liberalisation had picked up pace over recent years as Bank Negara was keen to allow for foreign lawyers and their foreign expertise to enter Malaysia to develop Malaysia into an international Islamic financial hub. The Legal Profession (Amendment) Act 2012 (“Amendment Act”), which amends the existing Legal Profession Act 1976 (“LPA”), was passed on 13 June 2012. Although it has been gazetted, it has not come into force yet. Once brought into operation, the Amendment Act will insert a new Part IVA into the LPA to allow for foreign law firms and foreign lawyers to practice foreign law in West Malaysia. For ease of reference, the relevant provisions of the LPA I will be referring to will be the sections as amended by the Amendment Act. This article will briefly analyse the legal framework for the impending liberalisation of the legal market although it will necessarily be confined only to West Malaysia in which the LPA applies. It would however be useful to first briefly set out a snapshot of the present Malaysian legal market in terms of how foreign law firms already have some form of presence here. Baker & Mckenzie has had its member law firm in Malaysia for years now while Trowers & Hamlins opened a non-trading representative office in Kuala Lumpur in July 2012. It was the first foreign firm to obtain such an approval from the Malaysia Investment Development Authority to do so. Two of Singapore’s largest law firms have also made its Malaysian presence felt relatively recently whereby Rajah & Tann and Allen & Gledhill have links with their associate law firms in Malaysia. Foreign law firms also regularly advise on Malaysian corporate transactions, where these firms are based offshore in Singapore or in other countries. The liberalisation as set out in the Amendment Act will provide for more options for foreign law firms and foreign lawyers to practice and advise on foreign law within Malaysia. There will be three entry routes into Malaysia for foreign law firms and foreign lawyers. While the amendments to the LPA sets out the general framework, the specific details on the conditions and criteria for entry will be set out in the rules to be approved by the Bar Council and the Attorney General. I am made to understand that these rules have been finalised by the Bar Council and they are presently to be approved by the Attorney General. Therefore, the details I highlight in this article are subject to the final approved version of the rules. Before fleshing out the three entry routes, I will highlight that the common element for all three is that each of these routes will allow a foreign law firm or foreign lawyer to only practise in permitted practice areas (see section 40F(8)(a) of the LPA for International Partnerships, section 40G(7) of the LPA for Qualified Foreign Law Firms and section 40J(2) of the LPA for foreign lawyers). While the permitted practice areas are not defined in the Amendment Act, the rules to be passed under the LPA will likely define the permitted practice areas as a transaction regulated by Malaysian law and at least one other national law, or a transaction regulated solely by any law other than Malaysian law. In the case of a Qualified Foreign Law Firm, such aspect of work regulated by Malaysian law shall be undertaken in conjunction with a Malaysian lawyer holding a practising certificate. Appearing in any hearing before a quasi-judicial or regulatory body, authority or tribunal in Malaysia. From a reading of the definition and the exclusions, the permitted practice areas are defined broadly to allow for foreign law expertise to be brought in to advise on foreign law or elements of foreign law. There seems to be a specific exclusion on work that deals solely with Malaysian law which would then still be areas within the exclusive domain of Malaysian lawyers. Further, there are ring-fenced areas of work, such as conveyancing and litigation, which are again areas only Malaysian lawyers can practise in. In allowing for foreign firms and lawyers to practise in the permitted practice areas, there are then three licenses which can be applied for which are set out below. A foreign firm may be licensed to operate in Malaysia as a Qualified Foreign Law Firm (“QFLF”) and under this licence, the QFLF can operate on a stand-alone basis. Based on the Bar Council’s recommendations, the foreign lawyers in the QFLF will have to be resident in Malaysia for 182 days, and not less than 30% of the lawyers in the QFLF would have to be Malaysian lawyers. It is important to note however that Malaysian lawyers who work in the QFLF would have to give up their practising certificate (see section 40G(8) of the LPA which states that a “Malaysian lawyer employed in a qualified foreign law firm shall be disqualified from obtaining a practicing certificate under Part III”). So the QFLF, even when advising on a transaction involving elements of both foreign law and Malaysian law, would not be able to practice Malaysian law and would have to instruct external practising Malaysian lawyers. The International Partnership (“IP”) is a joint venture between the foreign law firm and the Malaysian law firm. The permissible equity ownership and voting rights of the foreign law firm in the IP shall be determined by the Selection Committee [see section 40F(9) of the LPA] and the recommendations made by the Bar Council are that the Malaysian law firm should not have less than 60% and the foreign law firm no more than 40% of the equity and voting rights and of the total number of lawyers in the IP. Both the foreign firm and the Malaysian firm in a proposed IP would have to demonstrate that they have the relevant legal expertise and experience in the permitted practice areas. It seems that the IP will not require specific expertise in international Islamic finance unlike in the case of a QFLF. The IP will be entitled to bill its clients as a single law firm [see section 40F(8)(b) of the LPA] as well as recover costs and retain payments in respect of practicing in the permitted practice areas [see section 40F(8)(c) of the LPA]. Under this route, it appears that there will be a separate entity in the form of an IP, and with a Malaysian lawyer being both part of its Malaysian law firm as well as part of the IP entity. Individual foreign lawyers will also be allowed to be employed by a Malaysian law firm to practise in the permitted practice areas. It has been recommended by the Bar Council that the number of foreign lawyers employed by a Malaysian law firm shall not be more than 30% of the total number of lawyers in that firm. All individual foreign lawyers working in a QFLF, IP or Malaysian law firm will have to register as a foreign lawyer under the LPA. The registration of a foreign lawyer shall be in respect of a calendar year and may be renewed annually. An application for a license for the QFLF, IP or foreign lawyer will have to be made to the Bar Council. The new legislation provides for the establishment of a Selection Committee to make recommendations to the Bar Council for the granting of such licenses. The Selection Committee will be co-chaired by the Attorney General and the President of the Malaysian Bar, and the other members would be a person to be appointed by the Attorney General from the public sector and two members of the Malaysian Bar practising in the permitted practice areas relevant to the applications. It is expected that there will be annual reporting and accounting requirements in respect of QFLFs and IPs, and annual performance reporting in respect of foreign lawyers employed by Malaysian law firms. All QFLFs, IPs and foreign lawyers shall comply with the same rules and regulations applicable to Malaysian lawyers relating to professional conduct and ethics and therefore also subject to, for the purposes of disciplinary actions, the control of the Disciplinary Board. Part E. Prohibition against “fly-in fly-out”? The Amendment Act inserted a new section 37(2A) into the LPA which makes it an offence for any unauthorised person to do or solicit the right to do any act which is customarily within the function of an advocate and solicitor, including the provision of legal advice (whether Malaysian or otherwise). This provision would appear to prevent foreign lawyers (who are not licensed under the LPA) from flying in and out of the Malaysia to provide advice and to carry out any work relating to Malaysian law or even foreign law. This may be too wide a prohibition and this provision had attracted some criticism, especially with regard to restricting foreign lawyers from advising or acting in international arbitrations in Malaysia. Under the present law, there is no restriction against foreign lawyers acting in arbitrations in Malaysia (see the High Court case of Zublin Muhibbah Joint Venture v Government of Malaysia  3 MLJ 125 which was upheld by the Supreme Court). Two Bills were passed by the Dewan Rakyat on 24 September 2013 to relax this restriction imposed under section 37(2A) of the LPA. The new subsections 37(2A) and (2B) to be inserted into the LPA would have two main effects. Firstly, a foreign lawyer will be able to enter Malaysia to advise or consult with a client on any matter pertaining to foreign law provided that the accumulated period of stay will not exceed 60 days in a calendar year and that immigration authorisation has been obtained. Secondly, foreign lawyers advising or rendering any other assistance in arbitrations, or who appear as counsel or arbitrators in arbitrations in Malaysia, will be permitted to enter the country at any time and with no limit on the duration of their stay. Part F. What Does the Future Hold? It will be difficult to predict what the future holds in terms of the entry of foreign firms and whatever challenges the legal market will face. I list out some observations as I try to hazard a guess as to what may be expected and some of the challenges that may come along. As seen from the Amendment Act, the liberalisation of the Malaysian legal market is gradual and with the primary areas of practice for the QFLPs and IPs being that of foreign law albeit within the physical territory of Malaysia. While the QFLPs must demonstrate an expertise in international Islamic finance work, it is unlikely that the licensed foreign firms will wish to practice exclusively in the Islamic finance practice area. It is unlikely to be commercially attractive to do so and this has been highlighted years ago. So the licensed foreign firms, whether in the form of a QFLP or IP, will likely want to compete for work in the higher-end corporate practice areas. This may then impact the larger local firms as well as the boutique firms which are already competing in these areas. A higher level of competition will be to the benefit of the clients giving them more choice while also ensuring that the Malaysian firms raise their game to compete. It was common throughout the debates leading to the Amendment Act and of the two recent Bills on 24 September 2013 to hear certain quarters advising caution in that liberalisation must not lead to local law firms being cast aside. I believe that with the present restrictions built into the permitted practice areas, a majority of law firms and lawyers will not find that their work is being taken away by foreign law firms. So for instance, litigation, whether it is civil or criminal work, conveyancing and banking will still be in the exclusive domain of local lawyers. The local law firms which already regularly work with foreign lawyers to advise or to act in matters involving elements of Malaysian and foreign law may however feel the impact. Our foreign counterparts who used to be our instructing solicitors or who were working in the same cross-border team of lawyers as us, may now have a Malaysian presence and would be competing directly with us for such work. In terms of knowledge transfer, whereby the experience and expertise of the foreign firms entering Malaysia will be shared with the Malaysian firms, it can be seen how the Amendment Act and the eventual rules are intended to promote such a transfer. QFLFs can primarily only advise on matters on foreign law but will have to employ at least 30% of Malaysian lawyers. QFLFs would still have to engage external practising Malaysian lawyers to advise on any matters concerning Malaysian law. The joint venture model of the IP would also allow the Malaysian law firm partner to benefit from knowledge transfer. F.4 Is this Attractive Enough? There may be questions as to whether this proposed framework will be sufficient to attract foreign firms to enter Malaysia. It does appear to have generated some interest in the UK already. The foreign firms would not be able to draw on their non-practising Malaysian lawyers (in a QFLP) or their Malaysian partners (in a IP) to advise on a matter dealing solely with Malaysian law, even if it were to arise in a specific permitted area such as a merger or an acquisition. Hence, the foreign firm would not be able to market themselves as a seamless provider of legal services for cross-border financial work. The foreign law firms may then have to decide between the present existing system of maintaining associate or members firms in Malaysia and being able to advise on Malaysian law (and thus market themselves as being able to provide such seamless cross-border service) or the new system of limiting themselves into QFLPs or IPs. On the joint venture IP model, the similar joint law venture scheme in Singapore was of limited success and with substantial revamps that have been carried out over the years. It remains to be seen whether Malaysia’s IP scheme will enjoy better success. I am also not sure how comfortably the foreign lawyers and foreign law firms will fit into the present disciplinary regulations which were drafted to specifically govern the conduct of advocates and solicitors of the High Court of Malaya and had not taken into account foreign lawyers. How will our rules and restrictions, for instance on publicity or on websites, impact on foreign law firms if they practise in Malaysia? The balancing act to be struck is that of liberalising the Malaysian legal market to allow for the entry of foreign firms while also managing the liberalisation plan to give Malaysian firms time to mature and develop with the market. While on the one hand liberalisation can promote healthy competition and bring in legal expertise, the impending liberalisation will be gradual and can be tailored to fit the situation as the market evolves. It will be interesting to see the changes and the developments that occur once this framework is brought into operation. In one of the more recent Court of Appeal decisions, the Court of Appeal reiterated the entrenched principle in that it is only in rare and exceptional circumstances in which the Courts should interference with the discretion exercised by the Advocates & Solicitors Disciplinary Board in coming to a disciplinary decision of an advocate & solicitor. Alizatul Khair Osman Khairuddin JCA referred to this well-established principle in the decision of Majlis Peguam v Mohinder Kaur d/o Balbir Singh Deol (Court of Appeal Civil Appeal No. W-04-1324-2008). This Court of Appeal decision was appealed to the Federal Court via Federal Court Civil Appeal No. 02-60-10/2011 and on 25 June 2013, the Federal Court dismissed the appeal and affirmed the Court of Appeal decision. The summary of this principle is that the statutory mechanism for disciplinary proceedings of advocates & solicitors provides that a lawyer will be heard and tried before his own peers. It is for the statutory body, the Disciplinary Board, to then best assess the appropriate sanction and hence the Courts should rarely interfere in such decisions. This approach is set out in the following appellate authorities in Malaysia.